Head of Communications for their agreeing to sponsor this Blog competition and covering it in their newsletter tonight. If you have not signed up to the affiliate window affiliate network and their newsletter you should do. 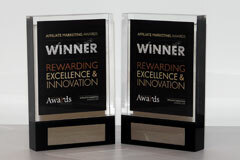 I would also like to congratulate Affiliate Window on for the 3rd year in a row winning the award for being the most Innovative Affiliate Network and the very desirable Publishers Choice of Network! at the a4u Awards. Affiliate Window do very well at the a4u Awards. Murray sounds like a great competition. I’ll have to work on it for you!